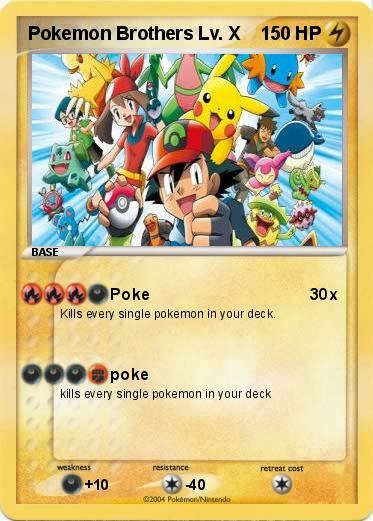 Kills every single pokemon in your deck. Pokemon Rules | mega beat your pokemon ex | Pokemon world | All the pokemon | Pokemon facts | human and pokemon | leggende pokemon | pokemon card | vote for this if you like pokemon | POKEMON!!!!!! | Pokemon Trainer | vote if you like pokemon | Pokemon In the world | Vote if you like pokemon | vote if u luv pokemon | WOOO POKEMON!! | metal pokemon | Pokemon Party | vote if you like pokemon | pokemon blast | pokemon | POKEMON | Pokemon | Pokemon | Pokemon | Pokemon! | vote if you love pokemon | Vote If Like Pokemon | starter pokemon | All Pokemon | pokemon | pokemon go | Pokemon Family | BROTHERS | Vote if pokemon is cool | StormTrooper | Rinder Brothers | The Brothers | brothers of destruction | Day Brothers EX | Brothers | THE BROTHERS | brothers | Brothers | Max and Kade | Vote if pokemon is 2 cool | The Jonas Brothers | Brothers | brothers | Venom | brothers lv.X | brothers | DSI | dog brothers | the cat brothers | Ice Brothers | Pichu brothers | Vote if you hate brothers | ken | shiny mew | the twin brothers | We Are Family | brothers | Brothers | Scorpion | Sub-Zero | Annie | shikie brothers | brothers | The brothers! !